President Barack Obama's nominees for secretary of defense and CIA director could be held up by Republican Sen. Lindsey Graham unless the White House provides more information about its response to September's attack on an American diplomatic post in Libya. @Sam_Richardson Her? Who is "her"? Lindsey Graham? You do realize that Sen. Graham is a man, right? Remember when Sen. Graham demanded answers and full break down of the president and key players activities after the 9/11 bombing? And when he demaned the same rigorous detail regarding the alleged WMDs that were cited as a reason to invade Iraq? Neither do I. I'm beyond being sick and tired of this surreal, amateurish partisan Kabuki theater. Shame on Lindsey Graham. Vote on the merits of the men, Senator. Just another example of how out-of-touch the GOP is with what Americans want and expect from their Congressmen and women. For the record, I'm all for the appointment of Chuck Hagel as Sec. of Defense. I'm sick and tired of all these idiotic right-wingers running everything in Washington D.C.! We need a sane foreign policy and that's that! Well said, Lyndsie. Thank you. Who is "her"? Lindsey Graham? 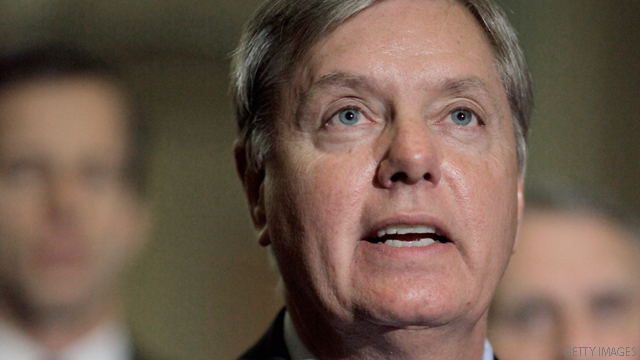 You do realize that Sen. Graham is a man, right?